I don’t know why I even pretend to be surprised any more at the kind of USB gadgets that get invented. Every week some queer product is presented to the USB port. Who imagines these things.. let’s make a vibrating dinosaur drinks holder! An USB egg heater? A nodding toy of Shakespeare that repeats Hamlet while keeping your lunch warm? If I didn’t take secret joy in how ridiculous they are, it would probably provoke an existential crisis in me that I spend so much of my life writing about USB gadgets. Anyway dear reader, let me tell you about a USB gadget. 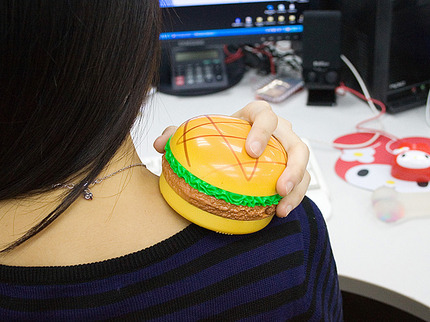 It’s a hand warmer and massager shaped like a burger and yes it plugs into your computer’s USB port. It’s from Brando who describe it as novelty, small and portable. Weighing 110g it warms your hands when you lay them on top of its bun and can also vibrate to produce a massaging effect. The lady below seems to like it. I can die happy now…….a vibrating hamburger. Indeed.